Kang and Kodos Johnson are a duo of recurring characters in the animated television series The Simpsons. Kang is voiced by Harry Shearer and Kodos by Dan Castellaneta. They are aliens from the fictional planet Rigel VII and appear almost exclusively in the "Treehouse of Horror" episodes. The duo has appeared in at least one segment of all twenty-five Treehouse of Horror episodes. Sometimes their appearance is the focus of a plot, other times a brief cameo. Kang and Kodos are often bent on the conquest of Earth and are usually seen working on sinister plans to invade and subjugate humanity. Speaking "Rigellian", which coincidentally sounds exactly like English, Kang and Kodos are Rigellians from the planet Rigel VII. Virtually identical in appearance, wearing breathing helmets, one of the few distinguishing characteristics is the duo's voices as Kang's is deeper. In most appearances they are antagonistic towards humanity. One exception is Kang and Kodos's first appearance in "Treehouse of Horror", where they capture the Simpson family and feed them exquisite cuisine. Lisa becomes suspicious of their intentions and accuses Kang and Kodos of wanting to eat the Simpson family. Kang and Kodos deny this accusation and are outraged. Afterwards both take the Simpsons back to Earth. Kang and Kodos have invaded the Earth on several occasions, with varying results. In 1996, Kang and Kodos impersonated Bill Clinton and Bob Dole and ran against each other in the 1996 election. At first, Americans declared they would vote for a third party candidate, but Kang convinced them that the option would be a waste of a vote. As a result, Kang was elected president. In their second appearance, they decided to take over the Earth after citizens had declared world peace, but ultimately failed. 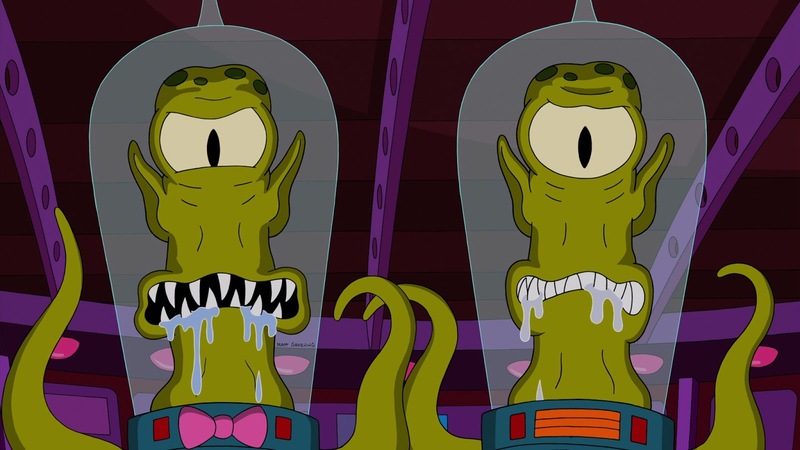 Kang and Kodos's religion is "Quantum Presbyterians", although Kodos later claims to be Jewish. Other Rigellians that have appeared include Serak the Preparer, who was voiced by James Earl Jones and only appeared in "Treehouse of Horror"